As a fan of David Lynch’s work, I found myself allowing him to steer me through transcendental meditation. It’s better than a damn fine cup of coffee. When I first thought about chronicling my experiences in the David Lynch Graduate School of Cinematic Arts at the Maharishi University of Management, where I am currently enrolled in their MFA in Screenwriting Program, I bounced between a couple of ideas. Would it be essays on my interpretation of David’s work? (See my articles on Twin Peaks) Would it be a narrative? Would it be a creative handbook, detailing the things I’ve learned? All of those ideas came before I actually started going to the school, and they’re all still valid. I could see myself writing any of them. 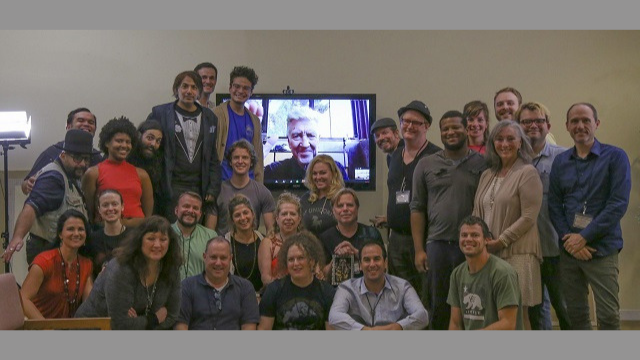 The creative advice I’ve received from my mentors, instructors, the program directors, my fellow students, and David Lynch alone with regards to my work is nothing short of pure gold, but right now, what I really want to do is talk to you about Transcendental Meditation and how it can be of benefit to creative people. Jesse Valencia with David Lynch. 2018. Photo by Mike Mahoney. Transcendental Meditation (TM) is a simple, effortless meditation technique with multiple benefits, both mentally and physically. In a world where people are tortured, even crippled by anxiety and depression, TM is an invaluable tool. When you do TM, the physiology of the body goes into a state of deep rest and the stress that constricts you just dissolves. For my own experience, it’s like all the negativity in my body sizzles and floats up to my temples and forehead like oil and an invisible hand pulls all that gunk right out of my face. Waves of bliss resonate throughout my nerves like sound and it is the most incredible sensation. But I imagine it’s different for everyone. I personally have a very visceral, very visual dive within almost every time. It’s the most psychedelic thing I’ve ever experienced, but it isn’t like drugs. Drugs distort the nervous system, whereas TM restores it. I do it twice a day for twenty minutes each and come out more refreshed and energised than when I went in. I first became interested in Transcendental Meditation as a teenager, when I was obsessed with The Beatles. They learned it in Rishikesh directly from the Maharishi Mahesh Yogi himself—who brought the technique to the West—and it helped the Fab Four write The White Album, their most creative work by a long shot. I wasn’t ready for Transcendental Meditation then, but I am now. After reading Lynch’s book Catching the Big Fish, I became obsessed with learning it. I didn’t just need it, I wanted it. As a musician myself, as a writer, actor, and now as a screenwriter at the David Lynch school, Transcendental Meditation and its benefits have changed my entire perspective on art and creativity. As I see it, we have, in the present time, is a poverty of art. That’s not to say that there isn’t very much art. Of course, there is a ton of art being produced every day, across every medium, in every culture. Yet, how much of this art is actually contributing to expanding happiness in the world? I’m not talking about the kind of happiness that disposable, endorphin-happy pop culture represents. I’m talking about meaning. How much art out there is being pushed to give people room to find a space within themselves where they can find and make meaning in their lives? How much of modern art is based in the material world, or in the perpetuation of materialism, whether in support of the materialist paradigm or not? Materialist ideologies informing our worldviews in the modern era have long exhausted their usefulness, to the degree that they are now contributing to worldwide moral and metaphysical decline at an increasing rate, particularly in regards to art. So much out there is corporate-sponsored garbage, or a critique of corporate garbage, or a transgression of corporate garbage. How many films have you seen in the last year which have caused you to feel something other than being entertained? It’s easy to entertain people. A little blood and guts, a flash of skin, and a little CGI wrapped up in a two-hour, ten-dollar package can go a long way. And by “long way” I mean tens of millions of dollars, or in some cases hundreds of millions. The Enlightenment period of the 17th and 18th centuries initially championed science, art, and reasoning for the better, but the socioeconomic systems that sprang from that beautiful period of human progress, for good and for evil—namely capitalism, socialism, communism, and the various forms of technological, cultural, and economic totalitarianism which have popped up over these past centuries—have since then collectively brought our planet and its resources to the very brink of extinction. As a result, world civilisation in the 21st century is in a state of perpetual decay. Our art reflects that decay, and it reveals symptoms of a much greater, much deeper problem. A change in perspective is sorely needed. To survive the never-ending doom and gloom of the ever-present future and produce art with real meaning, we must shift from these materialist-based worldviews to a consciousness-based paradigm and seek higher states of consciousness. In the materialist view, we know of three states of consciousness: sleeping, dreaming, and waking. But there are higher states which have been experienced. Higher states of consciousness, the Maharishi Mahesh Yogi teaches, are the goal of human evolution, and it is toward them that Natural Law guides every individual. As Lynch explains, the Transcendental Meditation technique is an effortless procedure which allows the excited mind to settle down gradually until the least excited state of mind is reached. This is a state of inner wakefulness with no object of thought or perception, just pure consciousness aware of its own unbounded nature. It is wholeness, aware of itself, devoid of differences, beyond the division of subject and object, a field of all possibilities where all creative potentialities exist together, infinitely correlated, but as of yet unexpressed. It is a state of perfect order, the matrix from which all the laws of nature emerge. It is also non-religious. Anyone from any religious background, even a non-religious background, can practice Transcendental Meditation and come away better for it. It does not replace any belief system. If anything, it enhances them. Where this concerns any artist, Transcendental Consciousness is the source of all creative intelligence. It is the wellspring from which every artist catches their ideas. Meditation frees the mind of restrictions and constraints so that ideas can flow like a flood instead of a trickle. I imagine it would be very appealing to someone looking for a cure to writer’s block, if there’s even such a thing. What I think writer’s block is is stress choking up those tubes of the mind where ideas pass through. Stress, negativity and darkness are writer’s block. The solution isn’t to fight darkness with darkness. The solution is to introduce light, and that light is consciousness. While materialism focuses solely on what is known and observable about the objective world—and this is reflected to a great degree in our various media—it fails time and time again to account for consciousness. In materialism, the physical world is all that exists, and consciousness is merely an evolutionary accident of random chemical actions and reactions spurred on by evolution. This has led to widespread suffering and division in the modern era, which has become a decadent, post-modern, hyper-technological Dark Age. From the consciousness-based view, it is not evolution which spurs consciousness, but the inverse: consciousness guides evolution, and the end goal of that evolution is happiness. Maharishi teaches that there is a “colourless sap” which pervades all things, a lifeblood to everything that exists throughout the cosmos. This is consciousness, but how does it work? The answer to that question is the Unified Field. According to Maharishi, the thing that keeps all of this existence in line is an invincible force called Dharma. Dharma is the managing intelligence of nature upholding everything in existence. Through various natural laws, many of which have been discovered by both modern physics (as well as ancient Vedic science), Dharma maintains evolution and forms the very basis of all cosmic life. Desire is the abstract principle which propels this evolution. As the expansion of one’s happiness is the purpose of life, evolution is the process through which that purpose is fulfilled, and desire is what guides the evolution. For Maharishi, the fulfilment of Dharma is perfection, achieved in higher states of consciousness where individuals are completely awake to the unbounded value of life and state of being. Artists, whatever their background or medium, desire to make art to achieve this happiness for themselves and for others. The ideas that come to an artist are subtle vibrations of sound which bubble up into their consciousness from the Unified Field. These vibrations, these ideas, are called Veda; and the artist, by their process, transforms these Veda into art. The word Veda means “knowledge” and is the totality of Natural Law. The source of all branches of knowledge, of all sciences, of all religions, and of all art is Veda, which is independent of time and can never be lost, because it exists in that unmanifest transcendental field of consciousness, which is the source of creative intelligence. In Maharishi’s teachings, he identifies different types of Veda as dynamic, vibrational structures that have their basis in sound and in intelligence. There are many types of Veda. However, in materialist-based art in the current age, these ideas have become grossly distorted and diluted. Where there is a poverty of art, one will find a poverty of ideas. In whatever paradigm, artists take these unmanifest vibrations of consciousness, these ideas, and manifest them in the objective world as art. The more attention an artist gives to their work, the more deeply others are drawn into it, because they can experience subtler and subtler aspects of its meaning, which then unfold deeper levels of awareness, which then expands happiness. The ultimate meaning of art, then, is to expand experience inward from the outer boundary of the work to the inner boundlessness of the viewer’s awareness, in the pursuit of joy. Art itself is evolutionary. Art itself is Dharma. Through the practice of Transcendental Meditation, the artist can refine and expand their consciousness to serve their work, their process, those who experience their work, and themselves. They open their minds to receive Veda, to receive ideas, and are more capable of fulfilling their desire to make art and expand happiness—both, for themselves, but more importantly for others—better than ever before. Thus, their art becomes evolutionary, in line with Natural Law, and resonates within others in various ways, with potential beyond the confines of materialist comprehension. In a word, their art becomes rich, their minds are opened, and their methods refined. That is the direction we need to go. Transcendental Meditation is the key to the whole thing. Through the practice of Transcendental Meditation, the artist can refine and expand their consciousness to serve their work, their process, those who experience their work, and themselves. After I learned Transcendental Meditation, my writing, my art and my music all became richer, and creating brought me so much more happiness. Another effect of Transcendental Meditation is that it dissolves stress in the body even better than sleep does. An artist can’t be stressed out when they make art. Not totally. There has to be joy in the doing. A work can be dark, but the artist takes great care and focus in crafting that darkness. There is a joy in that which is undeniable. A lot of misguided individuals believe they thrive on their depression and anxieties to give an edge to their art, but they have largely tricked themselves into thinking that. I’ve done this as well. For years, I thought if there weren’t some crisis in my life that I would lose that artistic edge, and looking back now, that was completely a bogus way of thinking, and it is bogus for the exact reason that it was based in the materialist worldview. My artistic concerns were rooted in the objective world only and ignored the total reality of what it was that I was doing. I was dependent upon an engine of negativity that I alone was responsible for, to create new terrible situations to give me excuses to make things. That kind of method is unsustainable. The truth is, you already are your edge. The happiness that comes from expanding your consciousness within has no degrading effect on the work in that way. Suffering, anxiety, depression, and all the awful things we cling to as artists, remain intact within the work because they are what make the work real. They’re a part of the world and we, being parts of the world, absorb them; but just because these things will enrich our stories, music, and art does not mean we have to give them permission to lord over our souls and torture us. All of that is within our power. Making art is, in and of itself, a joyful enterprise, and that joy comes from within. Whether or not a work of art is sad or depressing is one thing. The attention any artist gives to their work, that focus is what brings fulfilment to our lives. It doesn’t deplete the edge. It refines it. With Transcendental Meditation, that feeling can soak the entire process, like a colourless sap. By finding joy in the doing, one lends their strength to transforming the current impoverished state of art into one of unbounded riches, and thereby contributes to human evolution for the better, away from materialism and towards a paradigm based in the expansion of consciousness, towards an unbounded state of being that could only be good and nurturing for human society at large. I encourage every artist, in every discipline, to look up the many benefits of Transcendental Meditation, contact their local Transcendental Meditation centre, and take the steps necessary to learn the Transcendental Meditation technique. We have a motto at the David Lynch Graduate School of Cinematic Arts: “Meditate and Create!” By utilising TM as a tool, artists can achieve an inner success that is more rewarding than what material success can offer, and can share that inner joy with the world. You have to ask yourself the question: “Is your art meant to make the world a worse place or a better place?” I hope every artist will choose the latter. Jesse Valencia is a writer, musician, and actor. A veteran of the Army, Jesse’s poem “Reflecting On Five Years Of Service” was included in Warrior Writer’s 2011 anthology After Action Review. He earned his MFA in Creative Writing from Northern Arizona University in 2014 and is currently finishing his second Master’s, in literature, also at NAU. As a freelance journalist he has published feature music articles on the band The Brian Jonestown Massacre in both Phoenix New Times and Flagstaff Live! As an actor he has appeared opposite Tom Sizemore in the crime drama Durant’s Never Closes. In addition to writing and acting he sings and plays guitar in the band Gorky.